Today's #17 card uses another pre-colored digital topper from Digi Web Studio Cheryl Seslar's Sweet Wreaths (retired). Digital paper is from Kristin Aagard's Gingerbread Digital Scrapbooking kit, available at The Lily Pad and Papermania's A4 Jolly Santa paper pack. I added the sentiment to the center. As with #1, I added a little gingerbread man for embellishment. 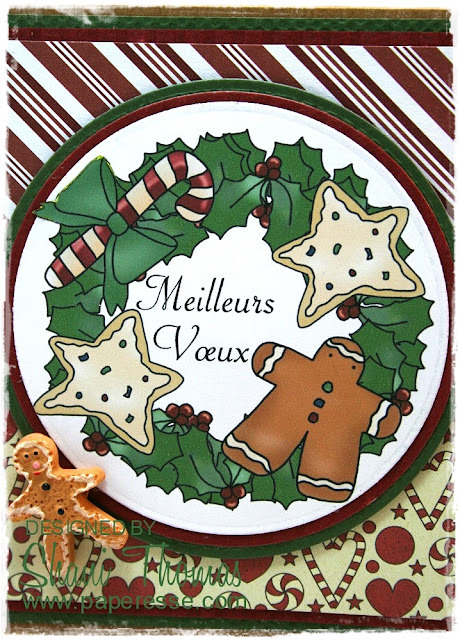 A bit of crinkled paper ribbon and Sizzix Christmas Trims #3 diecut border dress it up. Jolis papiers! Et l'image est tres sympa aussi! !